Rabbi and editor; flourished in Palestine at the beginning of the eighteenth century, but lived in Holland for a time, engaged in gathering funds for Jerusalem. His autobiography is to be found in the introduction to his edition of Moses ben Joseph Ventura's , Amsterdam, 1718. 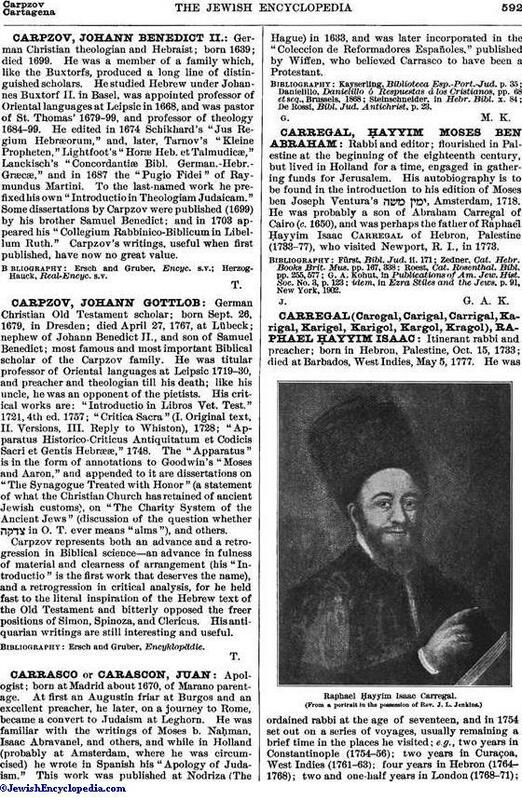 He was probably a son of Abraham Carregal of Cairo (c. 1650), and was perhaps the father of Raphael Ḥayyim Isaac Carregal of Hebron, Palestine (1733-77), who visited Newport, R. I., in 1773.
idem, in Ezra Stiles and the Jews, p. 91, New York, 1902.